Seal your home’s crawlspace! Learn how some sheet plastic could help reduce health problems and cut your Georgia home’s energy bills this winter! Can Sealing Crawlspaces Save Money? Homeowners should be aware of a big potential problem lying just beneath their feet. Although for many years houses have been built with unsealed crawlspaces, this could be costing you the chance to save money on your natural gas bills because you’re spending more on heating and cooling your home. Many crawlspaces are unsealed because it was believed that ventilation would be enough to let out excess moisture. However, vented crawlspaces have proven ineffective at reducing moisture beneath your floors, especially in humid climates around the Atlanta Gas & Light service area. This is because moisture spreads primarily through the air, so ventilation doesn’t let water out – it lets it in. Many Georgia homes with crawlspaces aren’t sealed. This isn’t a problem in itself, but if moisture is allowed to build up it can have a nasty effect on your home and make your family uncomfortable. Moisture in the air must be condensed out by your home’s air conditioning system, making it work longer and costing you more money. 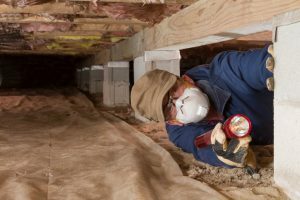 In winter, unsealed crawlspaces let cold, humid air right under your home infiltrate your home’s living area and will make you use more natural gas. So, we want to keep the moisture out of the crawlspace as much as possible, in order to save you money on natural gas. In addition to this, moisture in the air will condense on any cool surfaces. This means that during summer air-conditioning season, water will condense out on the underside of your flooring. This moisture causes rot and mildew, and can also lead to a range of health problems. How Does Crawlspace Encapsulation Help? Sealing a crawlspace is known as “encapsulating” it. In effect, this isolates the air in your crawlspace from everything around it, creating a “capsule” of air beneath your home. Tests in Baton Rouge and Arizona have shown that this reduces the moisture in the space by around 25%, making conditions significantly less welcoming for mold. How Can I Seal My Crawlspace? There are 3 main components to encapsulation. Firstly, vapor retarders will be placed across the floors and walls of the crawlspace, making it much more difficult for moisture to reach into the crawlspace. Secondly, vents will be sealed tightly, so that air cannot easily enter and exit from the outside. Finally, insulation is fitted around the walls of the crawlspace, ensuring that you don’t have to spend any more on heating your home with natural gas than you need to. Will This Save Me Money On Natural Gas? An encapsulated crawlspace will cut down on your energy usage, as well as improving the quality of air in your home and avoiding problems with mold and mildew. If you’re looking to save on your natural gas bills, there are several other ways to cut down on utility costs. Consider investing in efficient low-energy natural gas appliances as a way to save even more. Of course, if you haven’t already found yourself the cheapest rates on Atlanta natural gas, this is also the best (and the easiest) way to save yourself a lot of money.